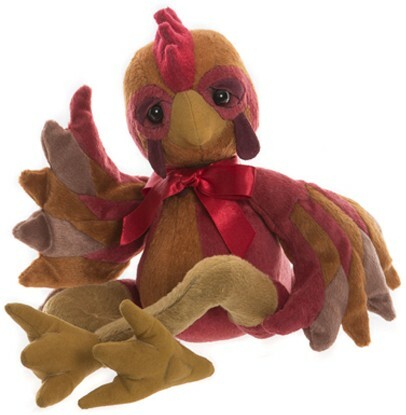 Corfe Bears > Charlie Bears > LIL' RED (HEN) 13"
This new series has been inspired by some of the famous characters in Aesop's Fables, which are the worlds best known morality tales, written by a Greek slave and storyteller in the mid-late 6th Century BCE. Each Fable has an accompanying moral to be learnt from and they are still taught to this day worldwide. Lil' Red is from the Fable "The Sly Fox and The Red Hen"
Moral: "Be careful about talking to strangers"
Lil' Red is made from velvety smooth plush fur in ginger, browns and red and has all the typical hen features, such as the wattle and comb, beak, wings and claw feet and she wears a pretty red satin ribbon. She is fully jointed and has long legs, which are bent at the knee and so will look great on the edge of a shelf, table or sat on top of something. She is very friendly and won't peck you! Look out for the other characters in this series:- SLY, SLOW COACH, SPEEDY, SARGE, WINCO HOPPER, DUNK and KISSES. Limited Edition of 600 worldwide! Lil Red is from the Charlie Bears 2019 Collection.